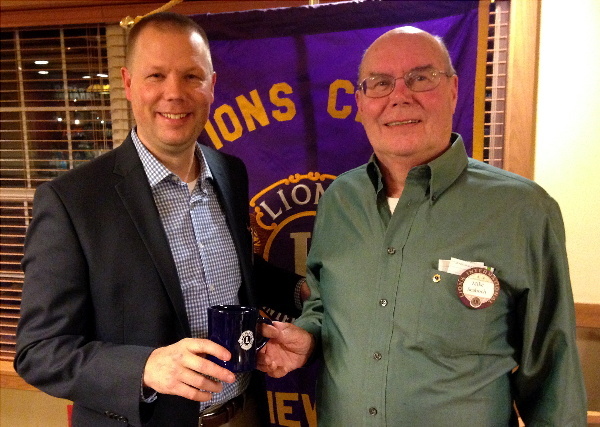 Lion Paul Malsom presented Larry Sloan a Lions Mug for his program on swords. June 28, 2017. 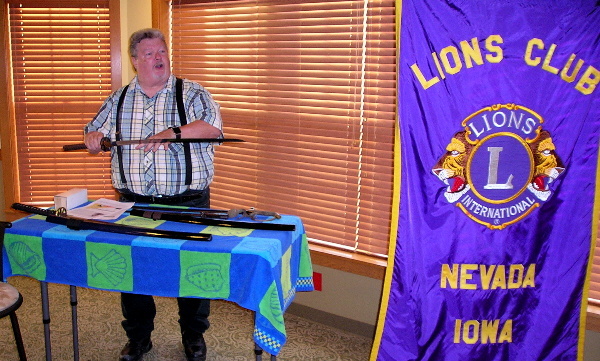 Larry Sloan, owner of the Talent Factory, gave an intersting program on Japanese swords. Larry has a Black Belt and has served as an instructor on defenses for law enforcement. June 28, 2017. 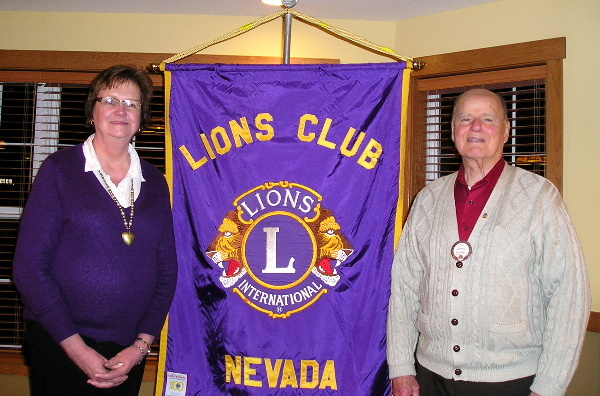 Lion Jim George recently transferred from the Perry Lions Club to the Nevada Lions Club. 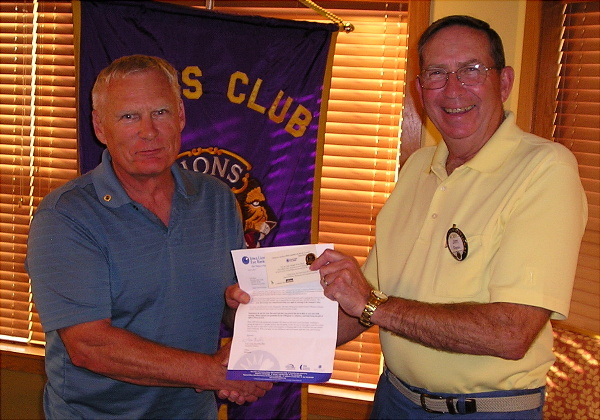 President Jim Fenn is presenting him with a certificate for volunteering to transport eye tissue. June 28, 2017. 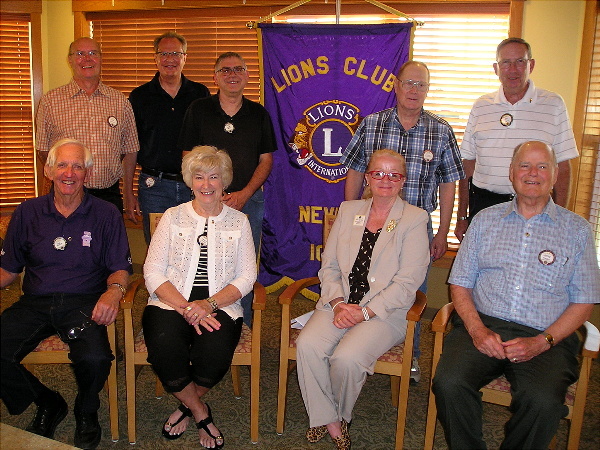 District Governor Elect Judy Stone from Marshalltown installed the 2017-18 Nevada Lions Club officers. 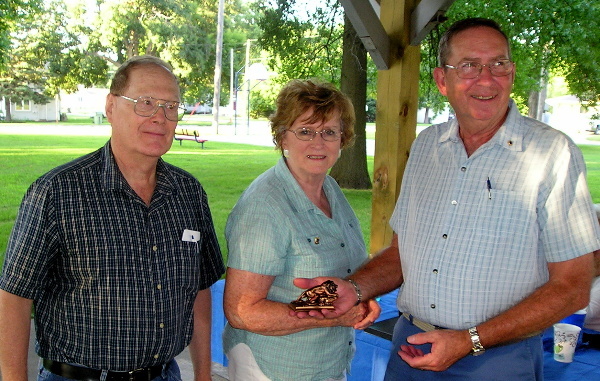 Front: Membership Director Bob Hunter, Lion Tamer Carlene Hunter, DGE Judy Stone, and President Jerry Radke. 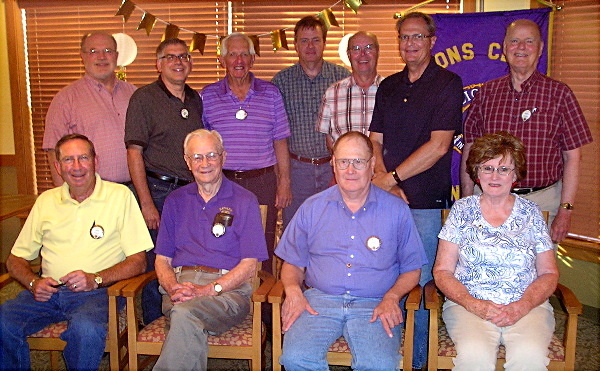 Back: 3VP Mike Seaboch, 2VP Paul Malsom, Treasurer John Beals, Secretary Loren Heckathorne, and Immediate Past President Jim Fenn. 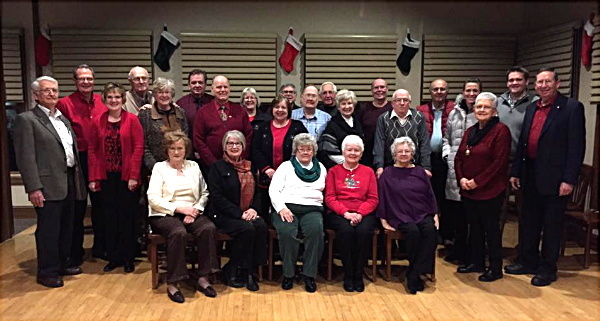 Missing are 1VP Susan Radke, Directors Elijah Hansen and Terrance Beaston, Tail Twisters Charlie Lloyd, and Charlene Jarboe. June 14, 2017. 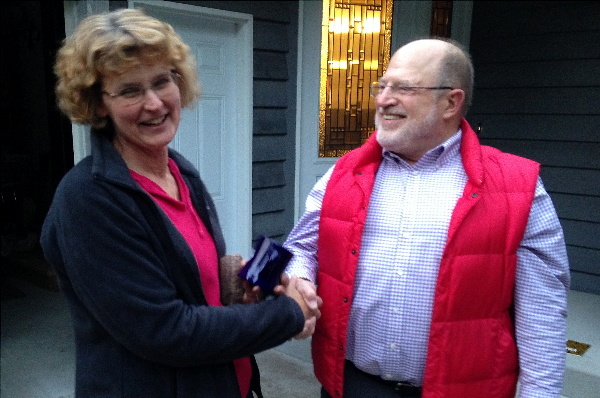 Lion Steve Jordening presents a Lions Mug to Dr. Jane Dawson, his program for the evening. May 24, 2017. 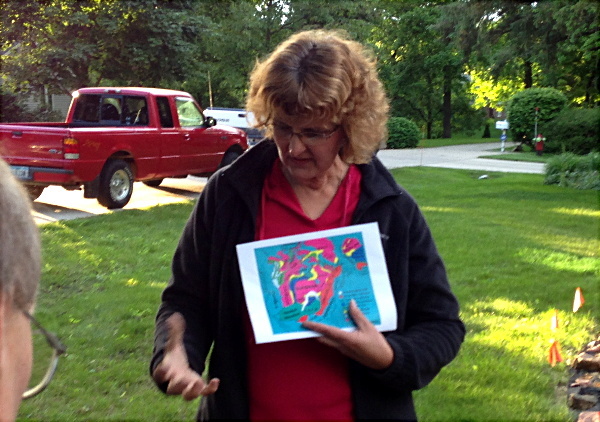 ISU Geologist Dr. Jan Dawson explaining how continents were formed. May 24, 2017. 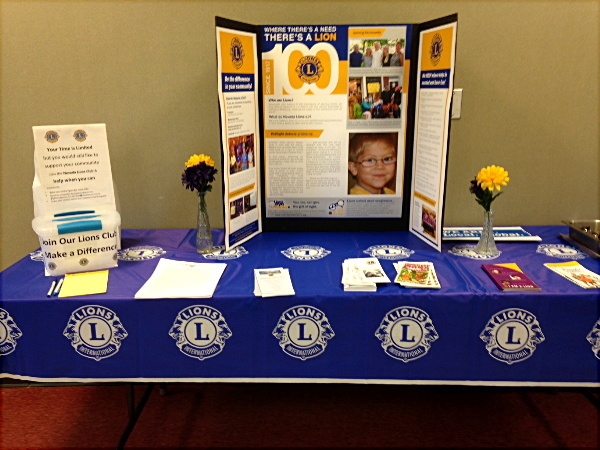 Nevada Lions Display Table for the 2017 May 13th Pancake Feed in Gate Hall, Nevada, Iowa. Part of the Pancake Feed Crowd. May 13, 2017. 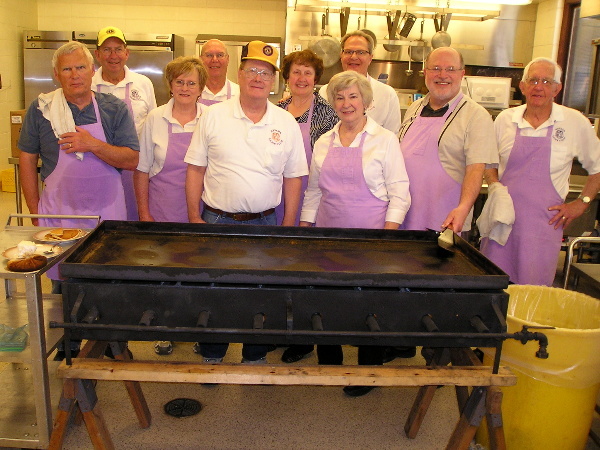 Nevada Lions Club clean-up crew after the Pancake Feed. May 13, 2017. 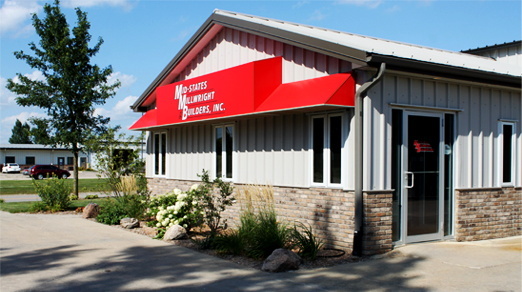 Randy Vier, Senior Vice President of Mid-States Millwright Builders, Inc. presented a program in their conference room about their sales and manufacturing of grain bins and storage systems. May 10, 2017. Charlene Jarboe's program for the evening was Rick Atkinson who spoke about local honey. Charlene is thanking him with a Lions Mug. April 26, 2017. Loren Heckathorne's program for the evening was Robb Schmidt, O.D. from the Nevada Vision Clinic in Nevada. Robb spoke about Eyes and Vision. 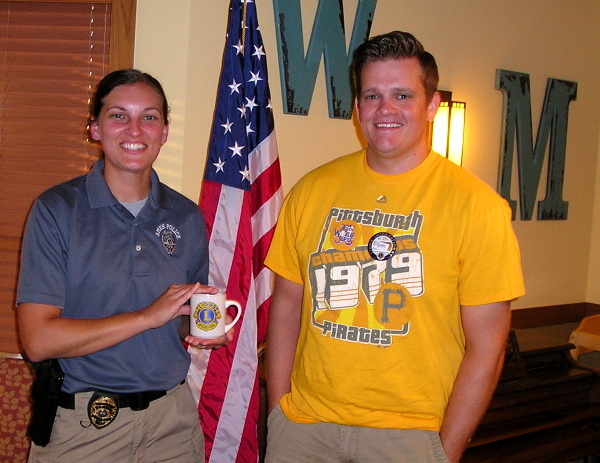 Here he is accepting a Lions Mug from Loren. April 12, 2017. Jodi Heeren, Student and Family Development Specialist, and Elizabeth Gindt, Academic Coach, from Family Resources at Nevada Community Schools gave our program for the evening. Elijah Hansen presented them with Lions mugs for being his program. March 22, 2017. Larry Sloan, owner of The Talent Factory spoke to the Nevada Lions about the history of the Camelot Theater and what shows are coming. March 8, 20117. 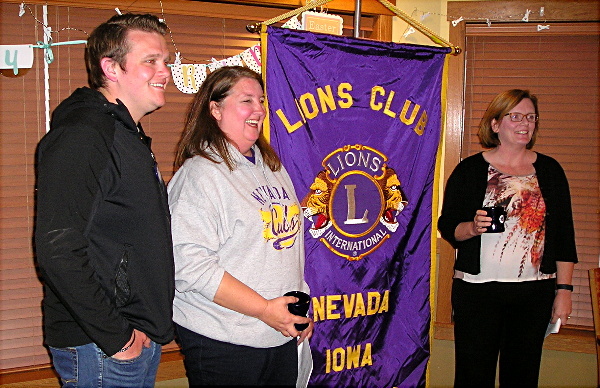 Nevada Lions 1VP and PDG, Susan Radke (far right) inducted 10 new Lions into the ISU Lions Club. 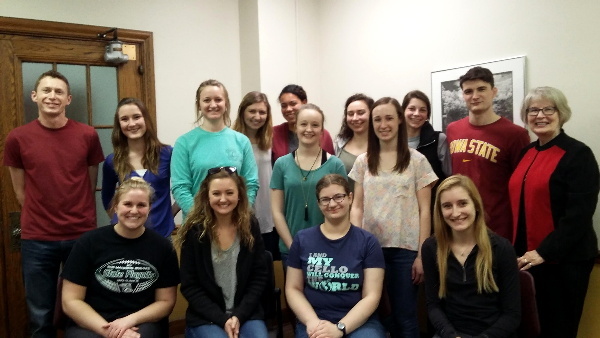 Susan is also the ISU Lions Advisor. February 22, 2017. Joel Fye, Principle at Nevada Elementary School spoke on "Box Tops for Education". 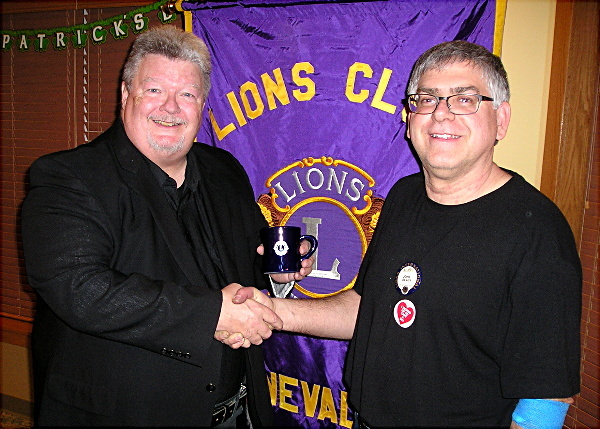 Here Lion Mike Seaboch is presented him with a Lions Mug for his program. February 22, 2017. 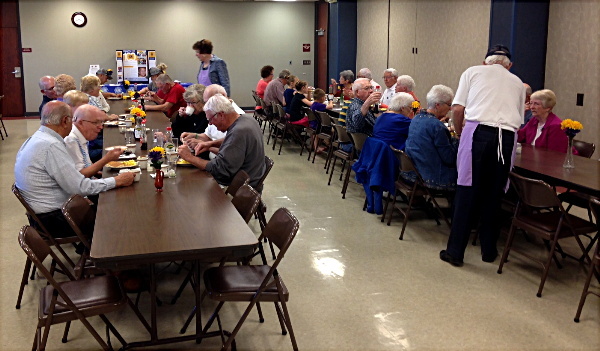 The Nevada Lions Club members helped prepare and serve pancakes for Food At First. February 13, 2017. 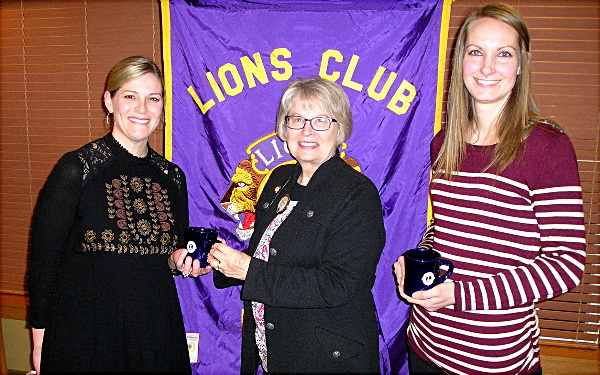 Nevada Elementary School counselors Erin Murphy and Emily Kruse are receiving Lions Mugs from Lion Susan Radke. They spoke about their positions, student's concerns, and how the Lions can get involved. February 8, 2017. 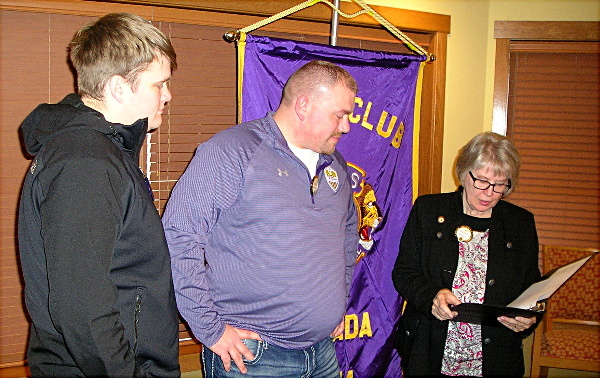 Lion Susan Radke (right) inducted new member Terence Beaston (center) as his sponsor Elijah Hansen looks on from the left. February 8, 2017. Lynn Scarlett from the Nevada Chamber of Commerce was Jerry Radke's program for the evening. Lynn spoke on upcoming Nevada events. January 25, 2017. 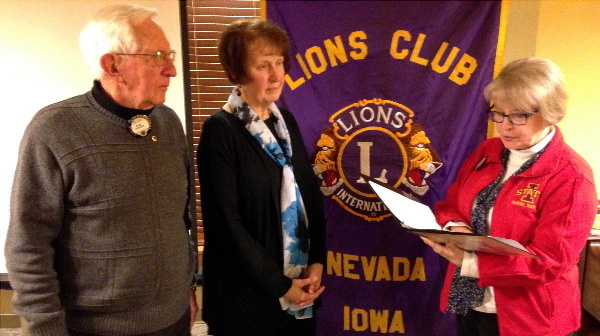 New member Sandy Richardson being inducted into the Nevada Lions Club by PDG Susan Radke (right) while her sponsor Bob Hunter looks on from the left. January 11, 2017. 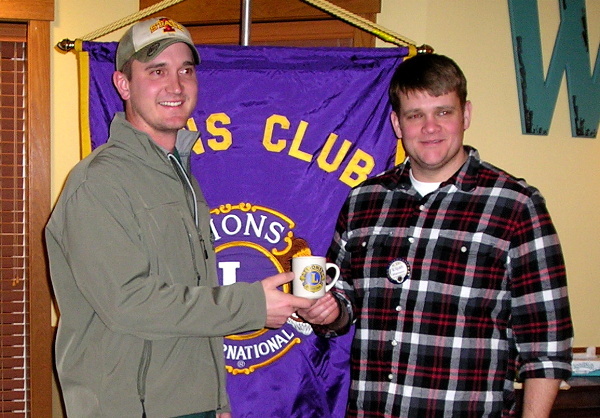 Luke Feilmeier, Story County Conservation Ranger being presented a Lions Club Mug by Lion Elijah Hansen. Luke spoke on the various county parks in Story County. January 11, 2017. 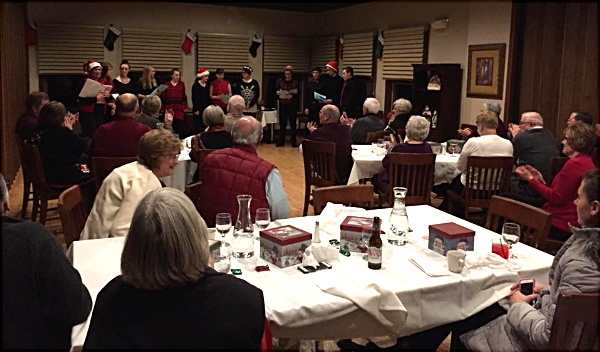 Nevada Lions attending the annual Christmas Party at the Indian Creek Country Club. December 14, 2016. Nevada Lions being entertained by the Nevada High School Jazz Choir. Dec. 14, 2016. 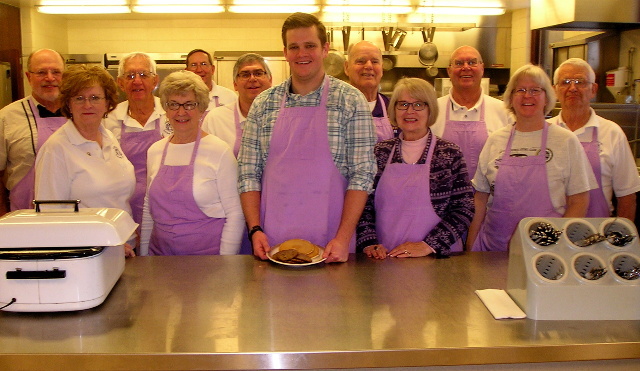 Nevada Lions who worked the Pancake Feed at Gates Hall on December 10, 2016. 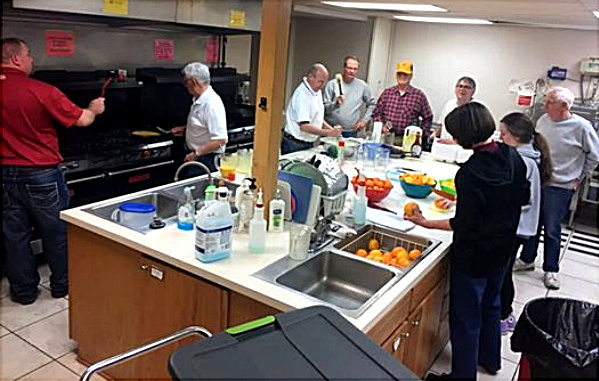 Peak Crowd during our Pancake Feed on December 10, 2016. 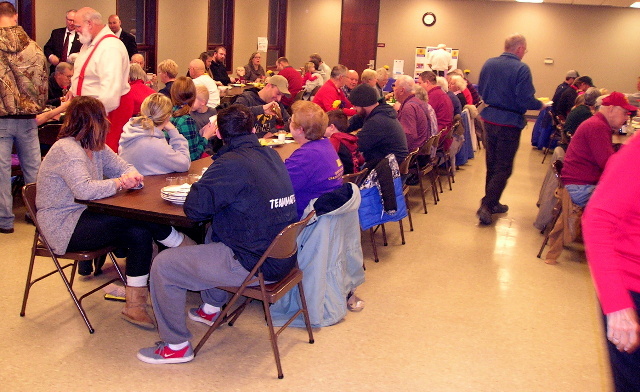 We served about 350 meals between 7 am and 11 am. 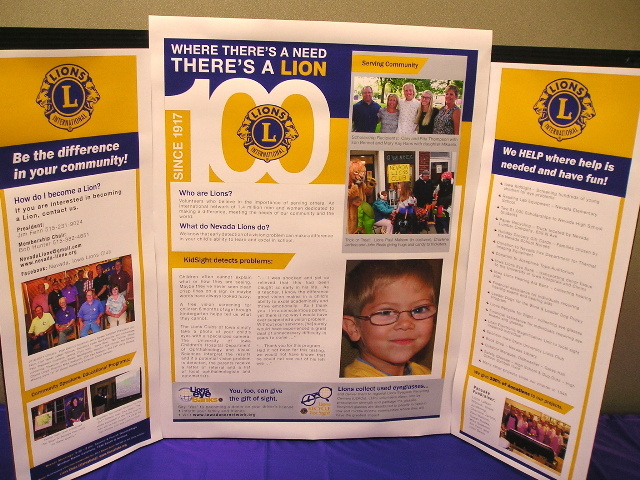 Our new Lions Display put together by Lion Susan Radke with input from other Lions. December 10, 2016. 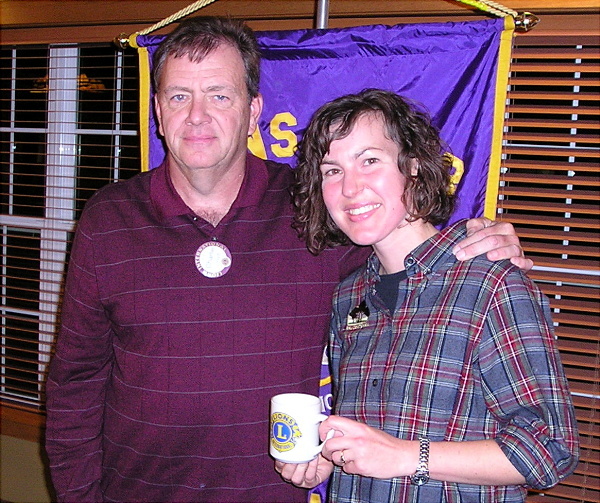 Lion Willy Morfitt presented a Lions Mug to his program, Lorrie Hansen, who spoke on the Resource Recovery plant in Ames. November 9, 2016. 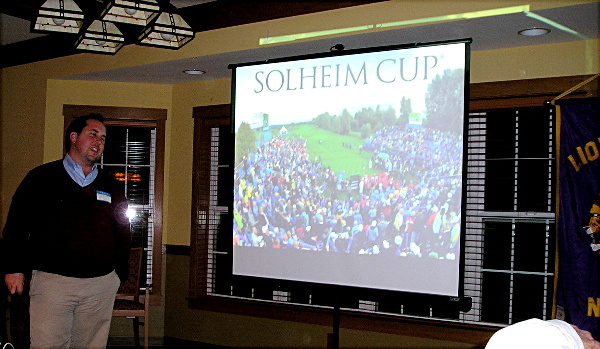 Assistant Tournament Director for the 2017 Solheim Cup, Drew Blass, gave the evening program. The ladies equivalent of the Ryder Cup for men will be played August 14 - 20, 2017 at the Des Moines Golf and Country Club. October 26, 2016. 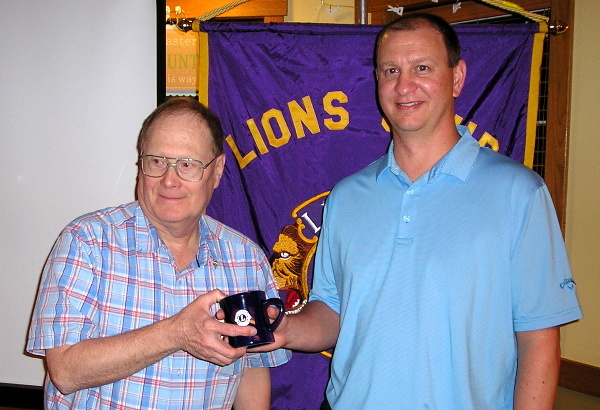 Lion Paul Malsom presented a Lions Mug to his program, Drew Blass. October 12, 2016. 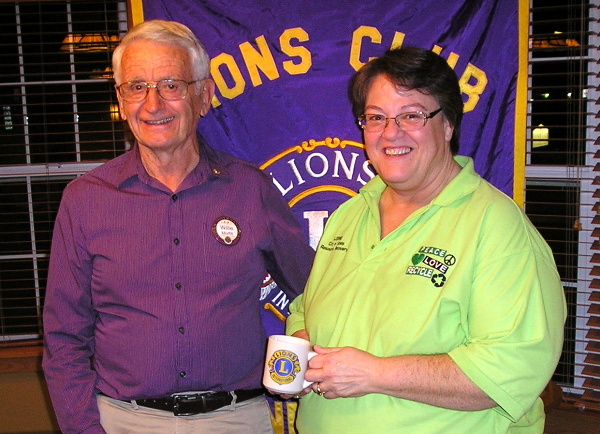 Lion Charlie Lloyd presented a Lions Mug to his program, Sally Gran. October 12, 2016. 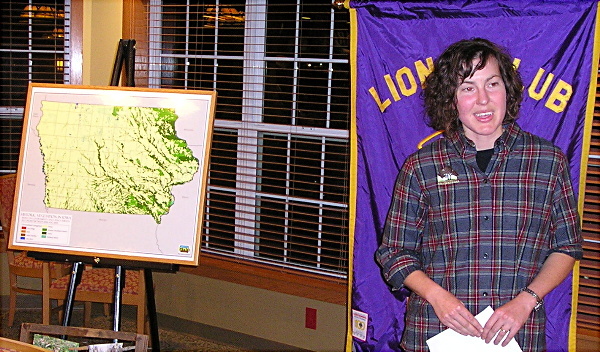 Farmer Sally Gran presented a program on "10 Ways to Manage Your Land for Water Quality". She spoke about four of them. October 12, 2016. 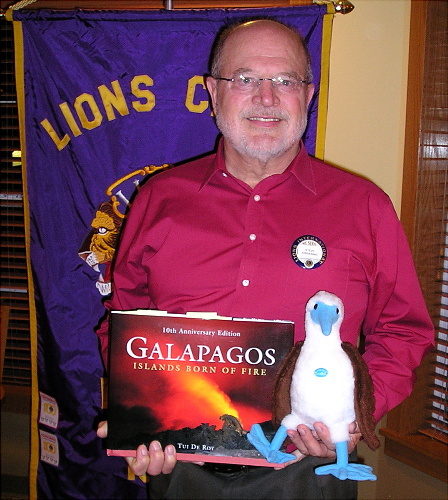 Lion Steve Jordening spoke on his recent trip to the Galapagos Islands where he experienced a variety of plants, birds, and animals. September 28, 2016. 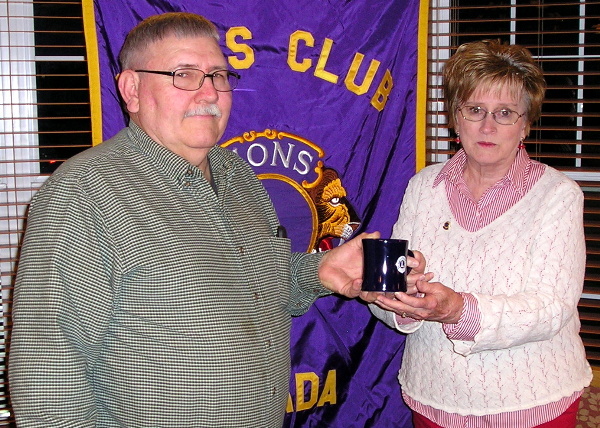 Charlene Jarboe presented a Lions Mug to her program for the evening, Charles Ganske, who spoke on Iowa Home Health Care. September 14, 2016. 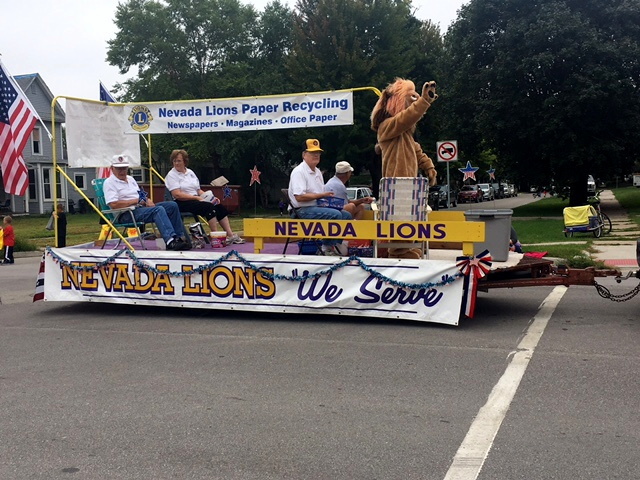 The Nevada Lions Club Float in the Lincoln Highway Days Parade. August 27, 2016. 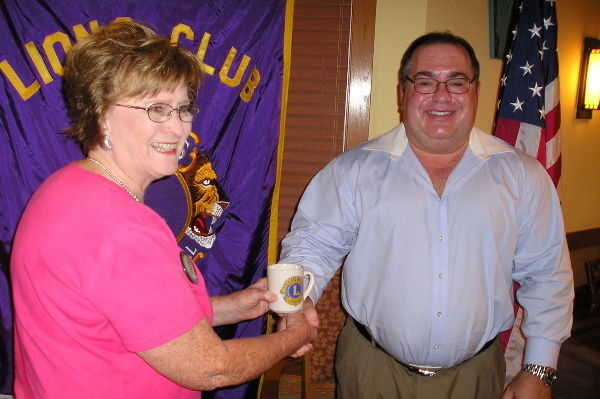 District Governor Bill Shutters inducted new member Carlene Hunter. Her sponsor is her husband Bob. August 24, 2016. 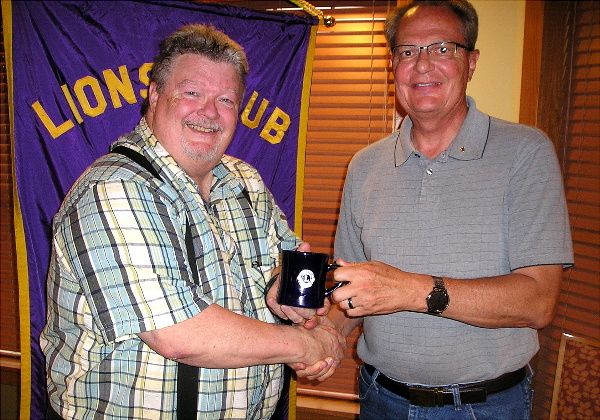 Lion Loren Heckathorne presented his program, DG Bill Shutters, with a Lions Mug. 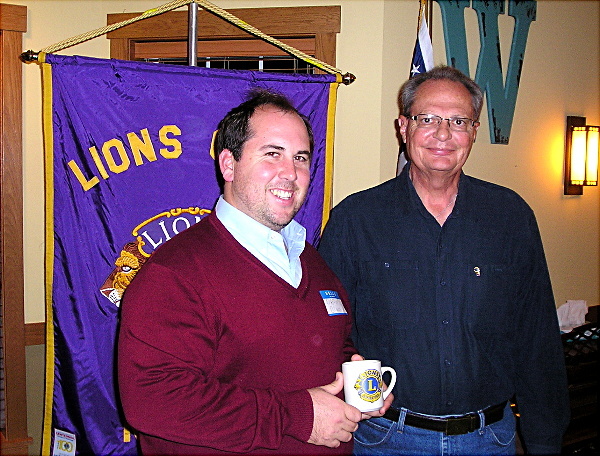 DG Bill spoke about his Lions experience and goals. July 24, 2015. 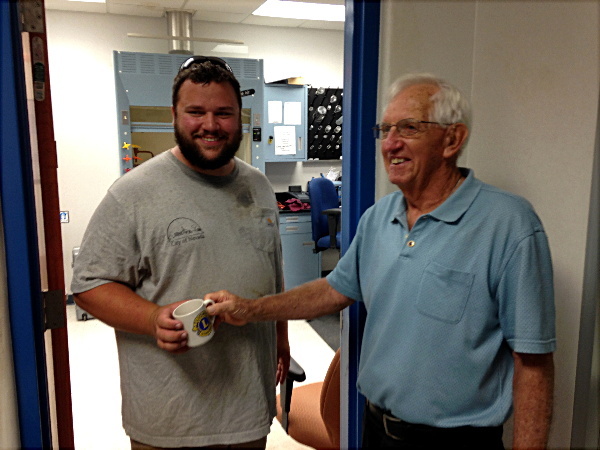 Bob Hunter presented a Lions Mug to Eric McLaughlin for giving our Lions Club a tour of the Nevada Water Treatment Plant. Aug 10 2016. 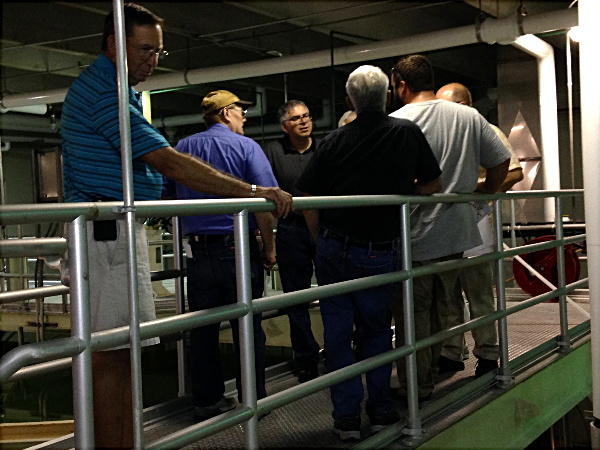 Nevada Lions touring the Nevada Water Treatment Plant with Eric McLaughlin. Aug 10, 2016. 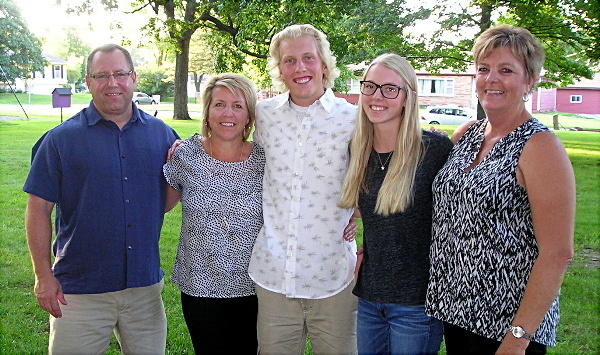 Cary Thompson and Rita Thompson, parents of Scholarship Winner Bennett Thompson (going to UNI) and Scholarship Winner Mikaela Rans (going to Mount Mercy in Cedar Rapids) with her mother Mary Kay Rans. July 27, 2016. Charlene Jarboe being presented the Past President's Plaque by Secretary Loren Heckathorne at our annual club picnic. July 27, 2015. 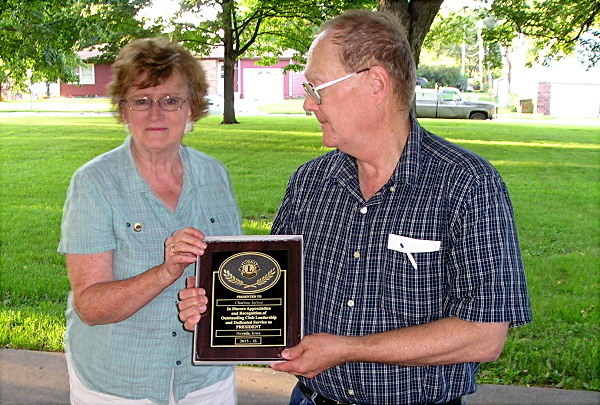 Secretary Loren Heckathorne presenting the Lion of the Year Award to Jerry Radke while Past President Charlene Jarboe observes. July 27, 2016. 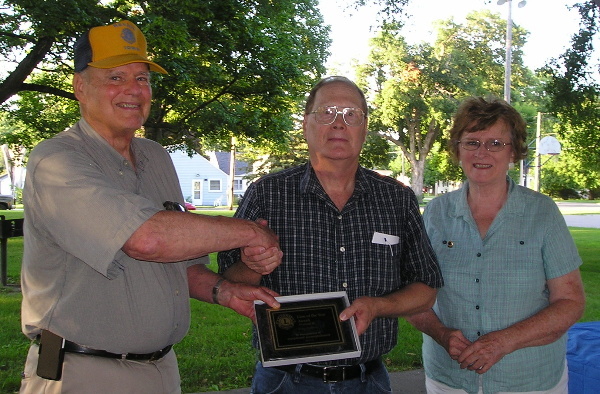 Secretary Loren Heckathorne and Past President Charlene present Volunteer of the Year Award to Jim Fenn at the Annual Lions Picnic at Hattery Park. July 27, 2016. Brook McPherson and Elijah Hansen presented the program for the evening. July 13, 2016. 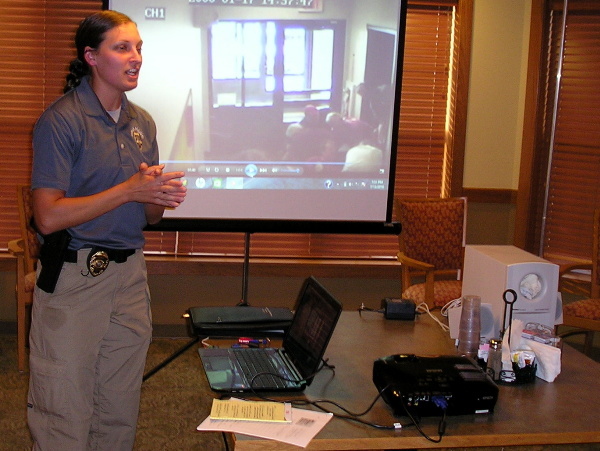 Officer Brook McPherson of the Ames Police Department presented a program on ALICE to our Lions Club. July 13, 2016. 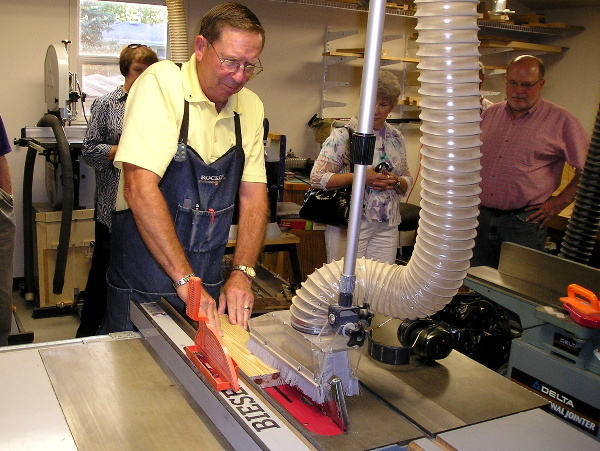 Jim Fenn presented the program in his workshop to show how to flatten and square a board. June 22, 2016. 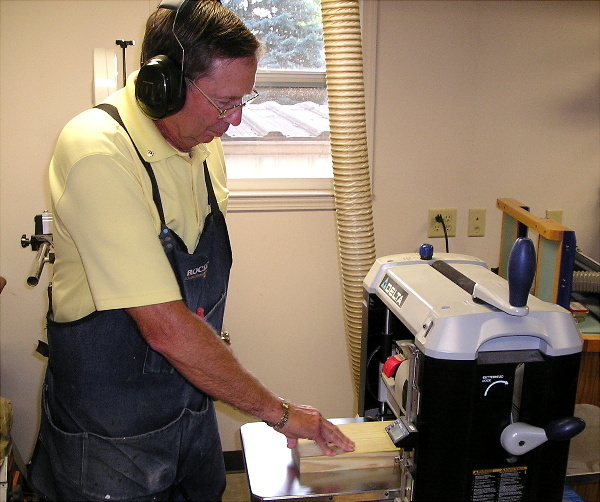 The final step is to make the second edge parallel and everything square using the table saw. June 22, 2016. 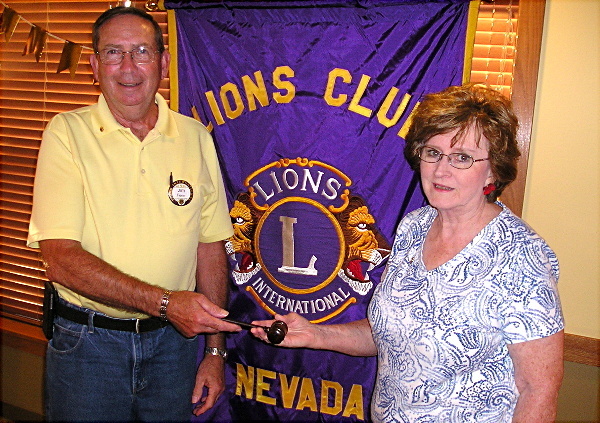 Outgoing President Charlene Jarboe (right) passing the gavel to Incoming President Jim Fenn. June 22, 2016. 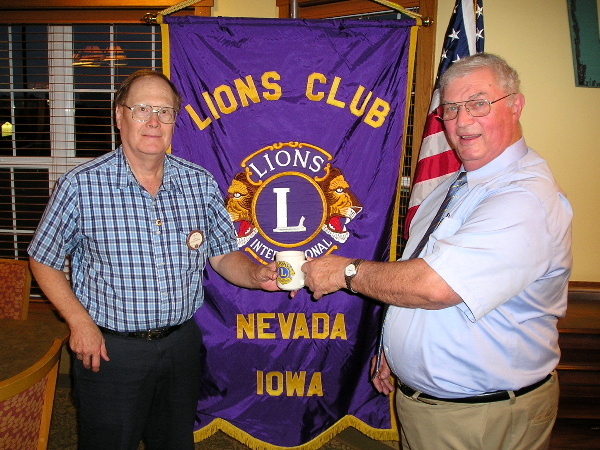 PDG Jerry Radke installed the 2016-17 Officers in the Nevada Lions Club. 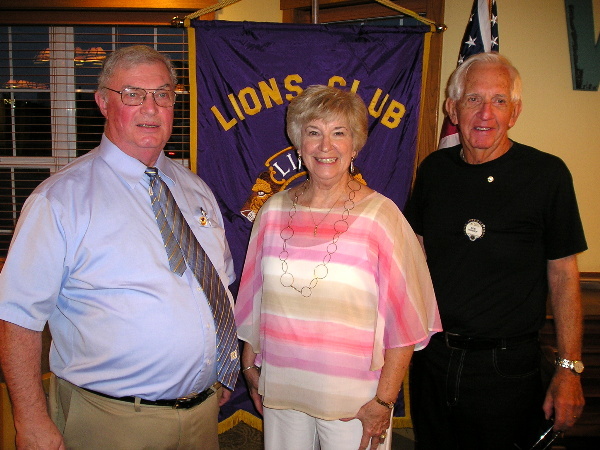 Front: President Jim Fenn, Lion Tamer LaNair Niblock, Secretary Loren Heckathorne, and Immediate Past President Charlene Jarboe. Back: Tail Twister Steve Jordening, Treasurer John Beals, Membership Director Bob Hunter, Tail Twister Charlie Lloyd, Director Mike Seaboch, 3VP Paul Malsom, and 2VP Jerry Radke. Missing were 1VP Susan Radke and Director Elijah Hansen. June 22, 2016. See Archives for more pictures.